What is ear wax and why do we have it? Ear wax in normal amounts is perfectly healthy, in fact, it is known to contain an array of anti-bacterial and anti-fungal peptides that help to shield our inner ear canals from any unwanted invaders. It is produced by wax glands found in the external ear canal. The amount of wax produced by these glands can differ greatly from person to person. In some cases wax production can get out of control, leading to serious infections and sometimes even hearing loss. How Can Hydrogen Peroxide Help? H2O2 is a simple solution of water with an extra oxygen atom that is able to dislodge even the most hard to reach areas of wax. It does this whilst also providing valuable antibacterial and antifungal benefits that help to keep our ears infection free. Before we get started it is worth noting that this will take around 20 - 30 minutes, so it is best to find a quiet point in your day before starting the procedure. The first step is to warm the bottles of olive oil and Hydrogen Peroxide. This can be achieved by placing the bottles in a bowl of very warm water for around 5 minutes. The next stage is to apply 2 or 3 drops of olive oil to the affected ear. This is done using the dropper. Tilt your ear upwards once the olive oil has been applied to avoid it draining out. After around 3 - 5 minutes you can drain the oil from the ear, this allows time for the warm oil to loosen the wax build up. Next, again using the dropper, add around 4 drops of 3% food grade Hydrogen Peroxide. This time it is best to leave it inside the ear canal for 10 - 15 minutes for the full oxidative effect of the H2O2. Do not worry about the bubbling sound, this is perfectly normal and is just the sound of the hydrogen separating from its extra oxygen molecule and becoming simply water and oxygen. Once the bubbling has come to an end it is time to once again drain the ear, This should be done onto a clean towel. Loose earwax may be present on the towel. Do not be alarmed as this means your ear is now clear. Repeat the procedure on the other ear. Treating Ear Infections - Hydrogen Peroxide is excellent at killing bacteria, making it one of the most popular home remedies in the treatment of ear infections. Preventing Infection of Newly Pierced Ears - Pierced ears are prone to infection until they heal. 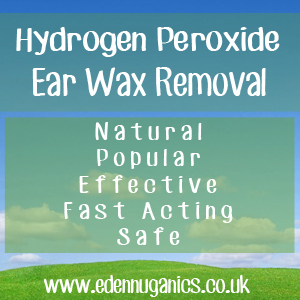 The antibacterial action of Hydrogen Peroxide makes taking care of your newly pierced ears simple and easy without the need to worry about infections. Preventing Colds and Flu - Tired of coming down with every cold or flu virus going? Although it may sound strange, adding a few drops of Hydrogen Peroxide to your ears at the first sign of illness is known to help reduce and in some cases even stop colds in their tracks. This may relate to Hydrogen Peroxides ability to enter your nasal area (as your nose, ear and sinuses are all connected), thus killing bacteria found there.